Hilary Evans died earlier today and I miss him very much. During the last ten years we spent many hours discussing and talking during visits at his and Mary’s lovely house in Lewisham in southern London. We met in 2000, 2003, 2004, 2006, 2008 and two times during 2010. And in September this year I and Håkan Ekstrand, who has been with me on most of the trips, should have visited Hilary again, now at his new home near his beloved daughter Valentine and her family after the house was sold last Autumn. But this will never happen. His wonderful wife Mary died in 2010 and after that Hilary never could find his full strength again. Now both of them are gone. I have so many memories from Hilary and Mary. Since they always opened their door for us and let us stay in a room at the top of the house. One of the saddest comes from 2006 when we first noticed Mary’s sickness that bit by bit should take her memories away from her and after a while put her in a separate world without contact with the rest. For Hilary, loosing his life long friend in this horrible way was something that never left his mind. Hilary was a man full of knowledge. 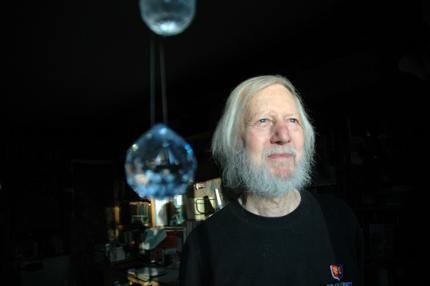 His contributions to UFOlogy are immense. Books like “Gods, Spirits, Cosmic Guardians” and “Visions, Apparations, Alien Visitors” should be required reading for everyone who thinks that they know the answer to the UFO enigma. When he published his book on ghosts, “Seeing Ghosts”, in 2002 not many bought it. It was a great book, probably the best I read on ghost. We used to sit in his kitchen over a beer or in his study sifting through books, discussing UFOs, his interest in what makes man tick and, as the years passed by, what he would do with his fantastic library. Late last Autumn he mailed me and said: If you can be here before December you can have it all for AFU, Archives for UFO Research. A couple of weeks later we met in London, at a time when he still was in hospital. Before December a lorry carrying 5,5 tons of books was heading for Sweden. During our visits I always tried to bring with me different brands of Swedish, Norwegian and Danish beer since Hilary loved a good ale. He not only tasted them but also sent me long and detailed reviews of every single bottle. Most of the times he gave them a good review but on one occasion he was chocked over the taste and confessed of having put most of the Jämtlands Bärnsten into the sink. Right now ten ales are waiting for Hilary in my basement. I am so sorry that I never got the opportunity to bring them to him. Hilary and Mary was connected in so many ways. They loved each other not only as man and wife but also as lovers of rare and old books. 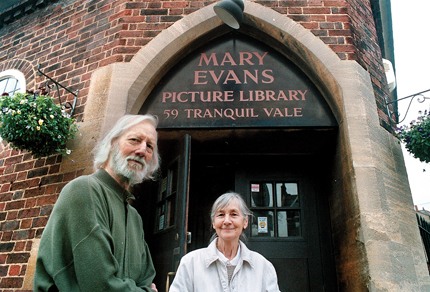 As they realised that their obsession with the printed word was something that did not passed away and also costed them a lot of money they started what is now one of Britain’s largest picture services, Mary Evans Picture Library, MEPL. Through that they could continue to buy the books they longed for and also make a living from selling not copyrighted pictures from them through the library. I, Håkan Ekstrand, Anders Perssons and other members of UFO-Sweden have walked the aisles of the fantastic MEPL-library many times. The walls are covered with illustrated books and magazines, most of them from the 19th and 18th century. Steel cabinets contained millions of pictures. More than ten employees worked there every day. This was Hilary’s and Mary’s legacy and pride. Mary collected books about dogs and had a room filled with them at the house in Lewisham. Many of those are now in the London Kennel Club’s care. She also collected every possible edition of “The Black Beauty”, this 1877 book about a horse and its life, sold between many owners, some good and some bad. A wall filled with several hundred editions from the very first to the latest was assembled just to the right of the stairs at the lower floor. But it was Hilary’s personal library that made us gasp. In a house with four floors and a spacious attic most of the walls where covered with book shelves. Even two of the bathrooms contained shelves filled with literature. Hilary and Mary was very well read and poetry, history and detective stories made company with the novels from the very best writers. 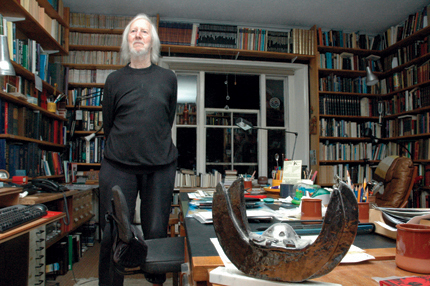 In the three rooms that made up Hilary’s study a UFO- and Fortean-reader could find everything he could imagine. Thousands of titles about visions, apparitions, ghosts, UFOs, archeo astronomy, parapsychology, magic, out of body-experiences, Atlantis, The Bermuda Triangle, fairies, folklore and anything and everything about those topics that caught Hilary’s imagination and curiosity. The last books by his own hand were about the Street Light Interference effect, SLI, and a tome, written together with his old friend Robert Bartholomew, “Outbreak!” an 760 pages thick encyclopaedia of extraordinary social behaviour. It was always the man or woman behind the experience or observation that made him interested. Why do we see ghost? Why do we report crafts from others worlds in our air space? Why is Virgin Mary showing herself to certain people? He wanted to write and read so much more. But his deteriorating eyesight made even reading problematic. His computer became not a tool for work but a problem. He could not find the emails and had a hard time reading them when he did. Hilary’s last ten months was spent in and out of hospitals starting with him being acutely sick in 2010, something he later could joke about telling us how he was being carried out to an ambulance as we met him in November last year. We all hoped that this was a passing problem. At his death he was at a local community hospital being treated for a kidney problem, from which he was recuperating, but contracted a chest infection two days ago. This morning Hilary Evans passed away peacefully with two nurses at his side. I had brief talk with his daughter Valentine earlier today. She was very sad of course. Knowing that a person you have loved for all your life is gone forever is something that no one of us can be prepared for. My thoughts are with her and her family. We will meet later in September. Before going to bed tonight I will bring one of the beers that I had saved for Hilary up from the basement and open it. I will drink it and think of you, Hilary. You where one of a kind. I miss you so much. Detta inlägg postades i UFO den 27 juli 2011 av Clas Svahn.